Oatmeal is not one of the most glamorous breakfast foods out there, but there are so many great things about oatmeal that it's a shame so many people have such a negative opinion of it. ESPECIALLY when you're eating Steel Cut Oats rather than quick rolled-oats. The steel cut oats hold their shape much better and have a better texture. Steel-Cut Oats are whole grain groats (the inner portion of the oat kernel) which have been cut into two or three pieces using steel discs. Golden in colour and resembling mini rice particles, they are as nature intended – nothing added and nothing taken out. Rolled oats are flake oats that have been steamed, rolled, re-steamed and toasted. Due to all of this additional processing they have lost some of their natural taste, goodness and texture. (source: McCanns Irish Oatmeal website) Steel Cut Oats are high in B-Vitamins, calcium, protein and fiber while low in salt and unsaturated fat PLUS - everyone loves food with variety. There are infinite ways to flavor your oats - sweet, savory? You name it, you can do it! Granted, Steel Cut Oats take longer to make, but the results are well worth the extra effort. Also, the oats can be made in advance and kept in the fridge for a few days. I personally like to make a big batch on Sunday evenings and store in small containers to grab and go for workday breakfasts. 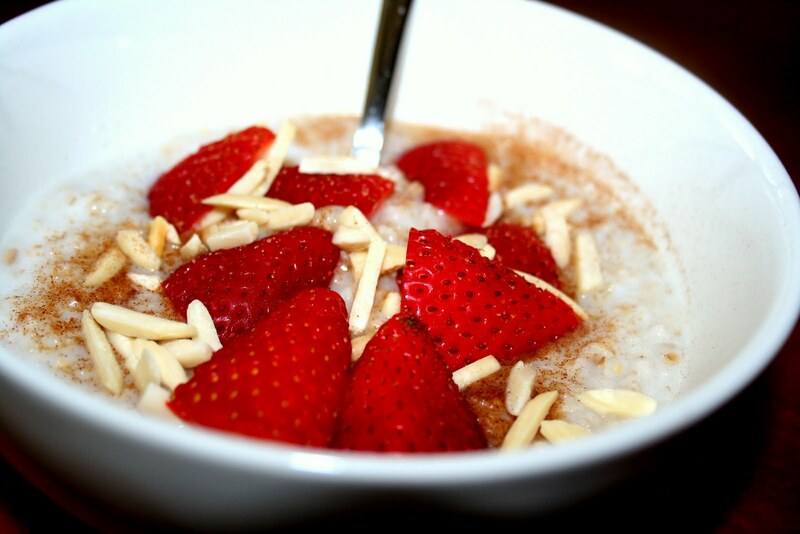 I heat it up at work with a little skim milk, some almonds, cinnamon and fruit (strawberries are my fave addition). Much better for me than grabbing a bagel, though on't get me wrong, I do love me some Asiago Bagels - which are on my list to make soon). Stir in oats and reduce heat to low. Watch to make sure the water doesn't foam up and boil over. Simmer uncovered, still on low, for about 25 minutes, stirring occasionally. ** If you're making to store and reheat you may want to cook a little less since they'll cook a little in the reheating stage. ** To reheat, add a splash of milk and microwave until heated through. Add desired flavorings.